Manuel Oliver, whose son Joaquin Oliver was shot dead inside Marjory Stoneman Douglas on Valentine's Day, unveiled the new billboard in Boston’s Back Bay neighborhood near Fenway Park, home of the Red Sox. Oliver designed the 90-foot long billboard featuring an image of the 17-year-old to advocate for stricter gun control. Parents of a high school shooting victim are using their son's image on a new Massachusetts Turnpike billboard to advocate for stricter gun control. 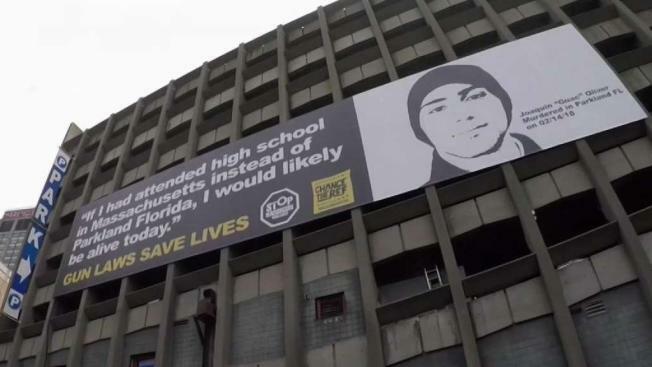 "If I had attended high school in Massachusetts instead of Parkland Florida, I would likely be alive today," the sign reads alongside an image of the boy, Joaquin Oliver. Seventeen-year-old Oliver was gunned down by a shooter at Marjory Stoneman Douglas high school in Parkland, Florida, in February. Joaquin's parents, Manuel and Patricia Oliver, designed and unveiled the billboard Thursday. "I think Joaquin is transmitting his message, his voice, through his billboard," said Patricia Oliver. "Now Joaquin is raising his voice constantly here, he's going to be sending a message minute by minute." The Olivers joined several politicians, police officers, and gun safety advocates to try to spread the message that change can come if voters make their voices heard at the ballot box. The Olivers believe that if Florida's gun laws were as strict as Massachusetts’ firearm laws, their son would likely be alive today. "It's too late for us to help our son Joaquin, but it's still early for other parents to save their sons and daughters," Manuel Oliver said. The Olivers say they may put billboards like the one in Massachusetts in Florida and other states to spread their message.